Happy Thanksgiving to those of you out there celebrating today. I (Sincerely, Emily) have a lot to be thankful for this year. I am thankful to be here to see one more day. Some days it has been very hard to be thankful for anything, but those moments have passed fairly quickly and I am So happy to be alive and doing so well. I find that I am thankful every day for so many thing. 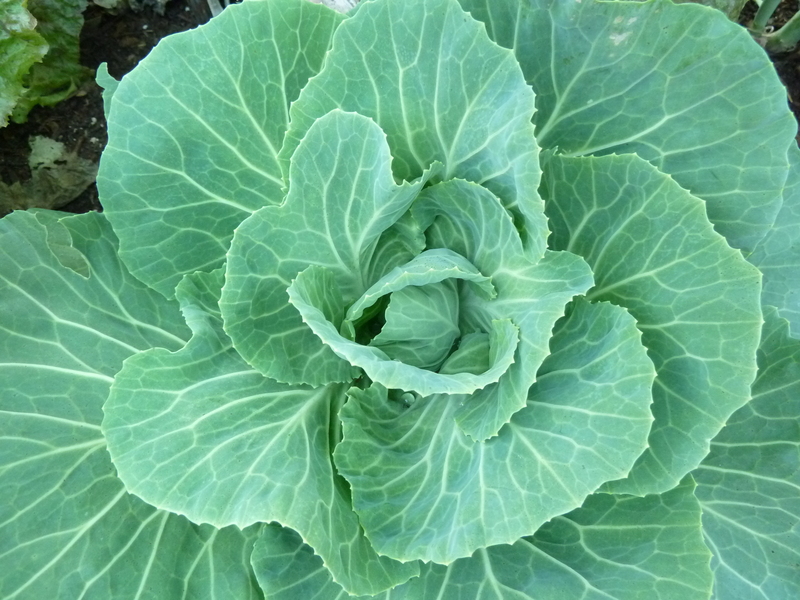 When I begin to get edgy or frustrated I just put myself back into place when I look at what surrounds me: fantastic husband, beautiful gardens, furry cats, a roof over my head, and the ability to be up and about and able to do things. When I was in my 20s, I managed a nonprofit art gallery. Aside from just being a really amazing job, one of the perks was that galleries are on really great P.R. lists, meaning we would get the most beautiful posters in the mail. Some of them ended up on the walls, but far more of them received a more, shall we say, ephemeral and, ahem creative, use. Sounds a bit horrifying, I know. Full color, quality paper, beautifully designed museum and gallery posters, torn to shreds on Christmas morning. But we would get dozens of these things a month. It was always a good day when I got to the mail first, because I learned this trick from the gallery director, and we would try to beat each other to the best ones. 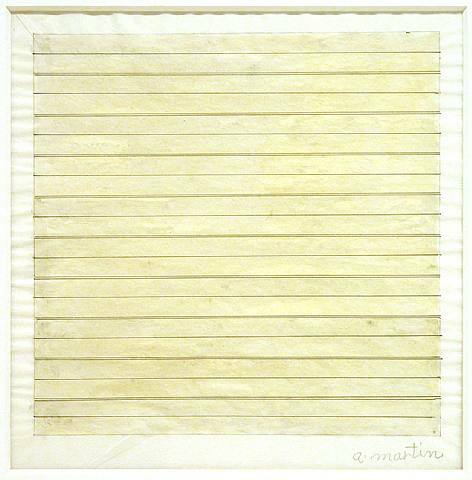 Granted, some of them we kept– I framed a gorgeous Agnes Martin “poster”; it’s actually a full color offset lith on rice paper. I gave others to friends. But most of them ended up under the Christmas tree. To give you some perspective, I worked there from 1981 to 1986. I still have several posters from this period, rolled up and waiting to be used. The point, of course, is that most of these, even the very beautiful ones, were bound to end up in the trash. The thing with “creative re-use” is that you can’t be afraid to creatively reuse things, just because they seem so, well, useful. What do you “creatively re-use” for the holidays? During the Hannuka festival I like to drive slowly through my heavily Jewish neighborhood and look for the menorahs. It’s one of the more charming traditions of Hannukah (which is a tradition with much charm), that the menorah is placed in the window, so everyone knows “we celebrate this here.” Judaism has many public expressions of private faith; it’s a religion of bravura and courage, which I suppose it has needed to be. While my parents were raised as Christians, I was raised to mistrust religion, so I’ve been somewhat on the other side of the windows for all of the winter traditions. I see the candles and the lights and the stained glass from the wrong side. No question, it’s beautiful from either perspective, but I’ve always imagined the interior of worship places to be a warm and mysterious communion where everyone knows the same thing; something I don’t, and can’t know. Religion is a foreign language to me. When my kids were born, I vowed that they would at least understand what was going on on the other side of the window, and we marked all the Judeo-Christian holidays with outward accoutrements: food and stories and decorations. We read the Hannukah story and lit the candles. 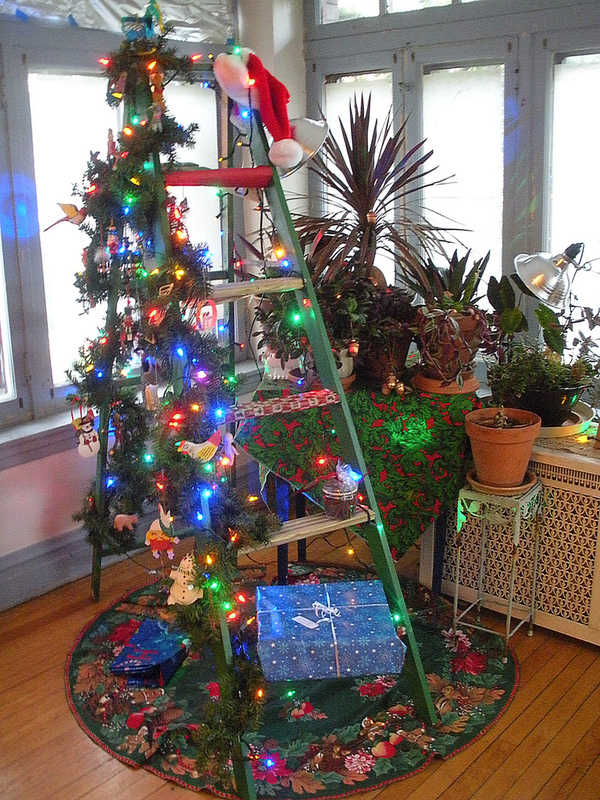 We had a tree and presents and read Dylan Thomas and St. Luke. Easter and Passover, Hallowe’en and Purim. If I had it to do over, I’d add Ramadan and Diwali, as well as Solstice and Equinox celebrations. Oh well, I’ll have grandchildren someday. Strangely, my husband, also not a Christian, has worked most of his adult life as a worship musician, in both the church and the synagogue. He knows the rituals inside out. He’s good at it, too. Even though the kids are gone, and there’s really no reason to do it, I still light the Menorah and say the prayer. Yesterday I made challah. There are Christmas lights in my window and my yard. I (Xan) really just starting baking a few years ago. Baking is one of those things that one does with one’s mother, and since mine died right at the brink of my adulthood, I didn’t really feel confident in doing it. Plus, it made me sad. But when I changed my food buying habits and diet a few years ago, I had to learn to bake, or no bread. And I really did kinda figure it out. I’m slowly figuring out bread, am something of an expert now, or at least fairly fearless, at scones, and last year I taught myself to make pies (including the crust). Here is one them, and it fits in with last Tuesday’s post about baking with my mother. Well, I (Sincerely, Emily) had wonderful intentions of making some cookies over the past few days…. ahhhh, that just didn’t happen. 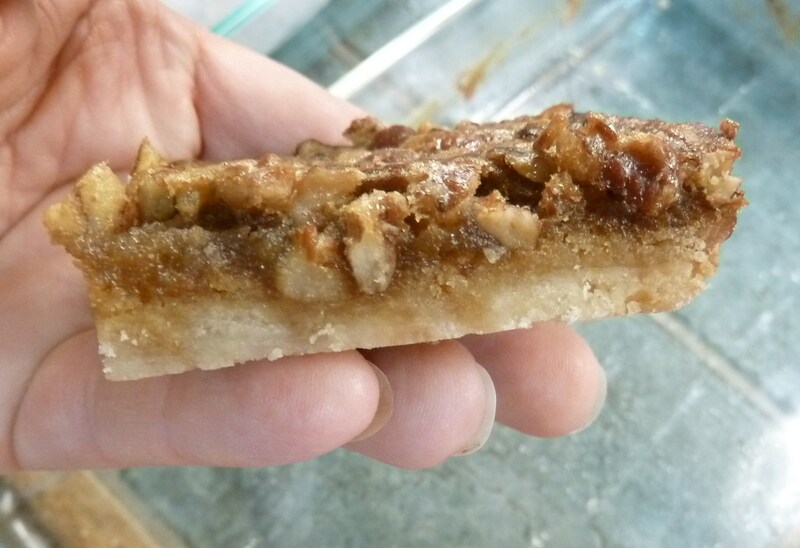 So, the only sweet treat you are going to see from me is in the post I did yesterday about the Pecan Pie Bars that I made. Oh, and there is the batch after batch of zucchini muffins and bread that I have been making over the past few montsh (and stashing in the freezer – and other people’s freezers too). What sweet treats have you been baking? Comment and add a link if you posted about them. I have been looking around for a different cookie recipe to take to a cookie exchange that I am going to next week. 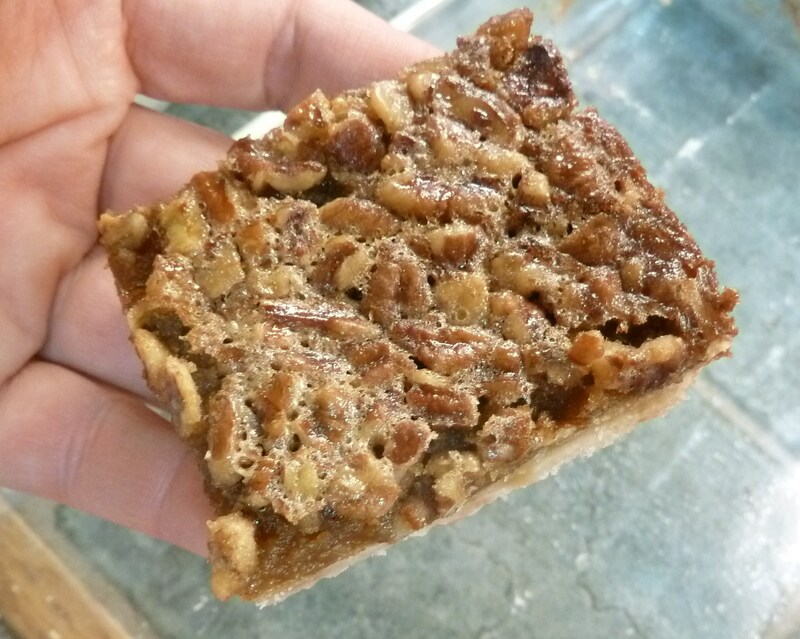 In the process I came across a recipe for Pecan Pie Bars. My husband is a big fan of pumpkin pie and pecan pie, and my neighbor usually makes the pecan pie and I usually make an apple cranberry thingy. Well, this year, for Thanksgiving, I completely dropped the ball on desert and Wednesday night by husband asked if we were having pumpkin pie…. ahhh, no. I did get him to agree to help me with the pecan pie bars and boy, they were great! Preheat your oven to 350F/180C. crust: combine flour, powdered sugar and salt. Cut in 1/2 cup butter until your mixture is course crumbs. Pat the crumb mixture into an ungreased 11×7 baking dish. Bake the crust for 20 minutes, or until it is a golden brown. While you crust is baking, mix together eggs, pecans, brown sugar, agave syrup, 2 T melted butter and vanilla. Spread this mixture over your baked crust. Bake for 20 minutes (350F/180C). Cool before cutting. We cut our bars rather large (15 bars). I know I will be making these bars a few more times through December and will cut them much smaller (24 bars). When I found this recipe, I didn’t have light corn syrup on hand, so I turned to our resident baker here at NDIN (Emily at Tanglewood Farm) about using a substitute and she recommended trying agave syrup. After I mixed the “filling” it seemed a bit thin and runny so I decided to add 1T of cornstarch to the mix. I have NO idea if this helped or not. All I can tell you is the “filling” was firm and came out fine. When I decided to try this recipe I was looking forward to using my Vitamix to make the powdered sugar. Before I got started, I looked up in the cupboard, waaaaay in the back, just to make sure there wasn’t any store-bought powdered sugar still lurking up there. OH, MY! I found A LOT of powdered sugar up there. I can’t tell you when the last time was that I used any powered sugar, but I can also tell you that even though I gave away a ton of food before we moved to Texas (4+ years ago), somehow this powdered sugar came with us. Crazy! I can also tell you that this stuff in OLD. I probably would have bought this when I was taking cake decorating classes when we lived in Palm Springs. That was about 10 years ago. YIKES! If any of you are from California, you will also laugh, because one of the packages is from Lucky (grocery store) and another box I found is from Stater Brothers. 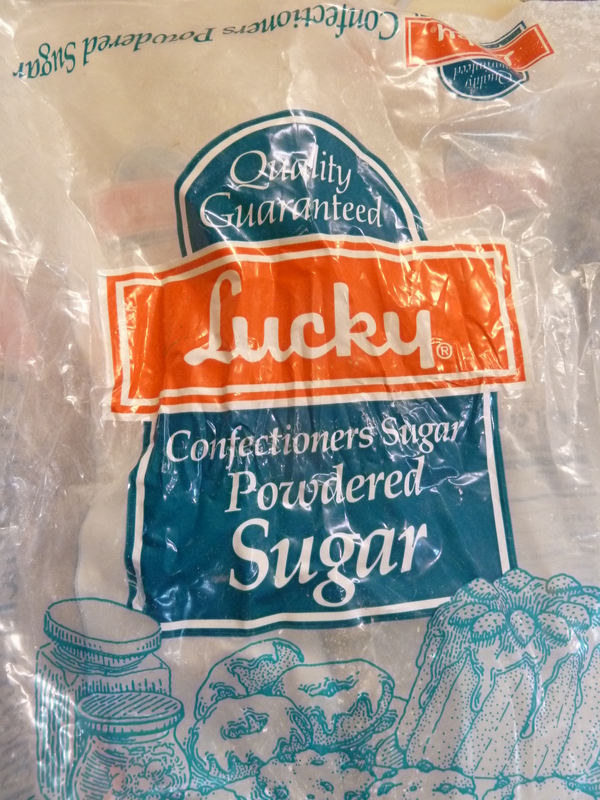 Lucky closed many years ago, but Stater brothers is still around out there. What kind of treats are you baking this time of year? When I was a little girl, and well into high school, my mother and I would make gingerbread people every year for Christmas. And not just any gingerbread people. We would make a list of everyone we knew, and make portraits of them in gingerbread. I carry in my head a memory of every surface in our kitchen covered with gingerbread people. Every year we would open up the cookbooks and search for the really good gingerbread recipe since we could never remember which one it was. Finally, in a moment of facepalming, I remember my mother writing “this is the one!” on the proper recipe. After my mother died, I can’t remember if I kept this up, although I have a vague memory of trying to revive it with my own children. However, for whatever reason, “kids these days” or my ambivalence about baking, or a sense that people didn’t really appreciate the gesture, the tradition fell off. I revived it a couple of years ago, making some for Wei’s church ladies, and my office mates. When you lose someone you love, you hold tight to little things like notes and their personal belongings. My mother’s cookbooks are among my most treasured belongings, and her notes, in her precious hand, make me feel like she’s still here. I want to restart this tradition, maybe with my borrowed grandchild Tete, maybe with my daughter (or both of them). In my mind’s eye I can see the writing on that page. I have all my mother’s cookbooks, and yet it isn’t there. So the tradition, in its entirety will continue. My daughter and I will see if we can identify the “good” recipe, just as my mother and I searched for it every year. I can see where this will become a family story, of the search for the best gingerbread recipe. It’s one of those things that makes holidays real. Do you have a recipe for gingerbread men? Link it in the comments! Maybe I’ll use yours!